Yilmaz Cakir has graduated the Anatolian University - Business Administration and he has Major in Business Management and minor in Economy. He was Secretary General and Vice Chairman of Chamber of Industry, Executive Board Member of Organized Industrial District. Yilmaz have been general manager of several large companies in Turkey till the establishment of his own company in 90s. 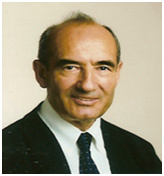 He has been Board Member of Turkish-Greece Business Council till 2007, acting Chairman of Turkish – Swedish Business Council and Board Member of French - Turkish Business Council till 2015; Since 2012 Mr Cakir is Founder and Manager of Başakşehir Living Lab (http://basaksehir-livinglab.com) and in 2015 he founded the StartersHUB (Start-up Company). Yilmaz is a Board Member of ENoLL (European Network of Living Lab) 2016 – 2019 (www.enoll.org).